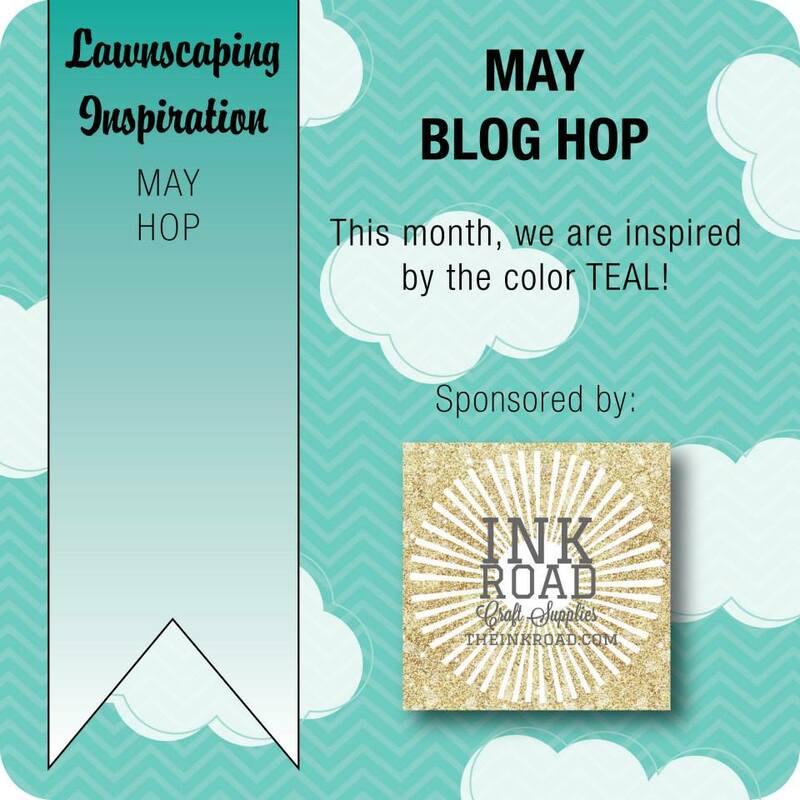 It’s the last Friday of the month, so that means it’s time for the Lawnscaping Challenge Facebook Inspiration Team’s (FIT) Monthly Blog Hop! You’ve probably arrived from Lexa’s blog, but in case you’re starting here, you’ll find the full hop list at the bottom of my post! This month’s hop is once again being sponsored by The Ink Road! Be sure to visit The Ink Road and Lara’s blog! We’ll pick a winner from all of the comments left on our hop to receive a gift certificate to The Ink Road! 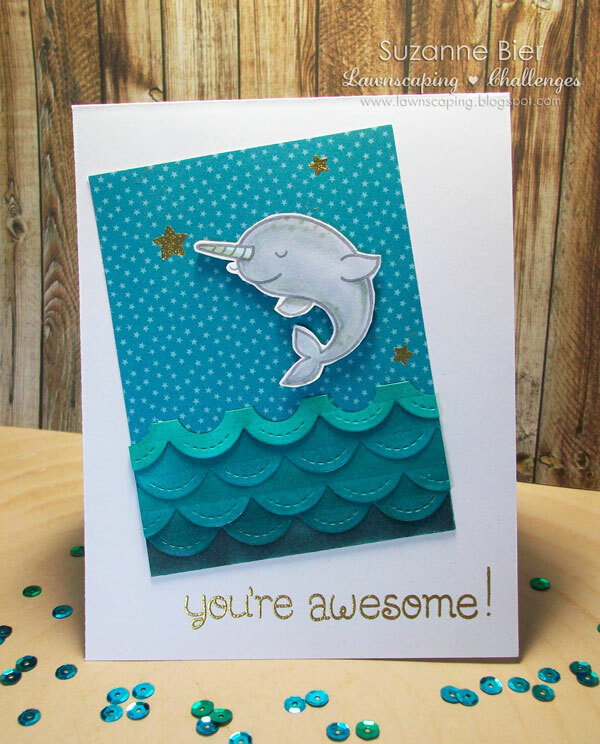 TEAL is our inspiration color for this month’s hop, so I made a card with the narwhal in Lawn Fawn’s “Critters in the Arctic” stamp set . The stars are from the “Lucky Stars” stamp set. I cut a panel from a sheet of teal star patterned paper in the Beachside petite paper pack. The waves are made from strips of white card stock that I cut with the largest of the “Stitched Scallop Borders” Lawn Cuts dies. I used five different Copic markers (BG15, BG18, BG53, BG57, and BG78) to color the strips so that they’d create an ombre effect when layered. I used a 1/2″ circle punch on the top die cut strip to make the top wave. Before you continue the hop at Yuki’s blog, be sure to leave a comment for me so you can have a better chance of being the lucky winner of a gift certificate to The Ink Road! Thanks so much for stopping by today! I hope you’re enjoying all of the inspiration in today’s hop and are going to have some time to craft this weekend! 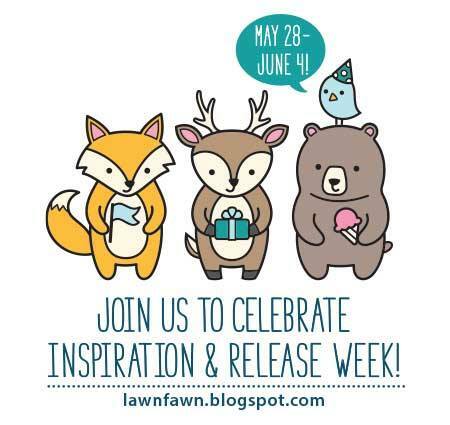 Lawn Fawn just kicked off an inspiration and release week celebration on their blog! Make sure you stop by the Lawn Fawn blog to get in on all of the release week fun! Now how fun is this?! Love it! Very creative with the scallop border die – awesome card! Very sweet encouragement card…love the scalloped waves. Love that fun scalloped ocean! Super cute card! I love the waves in that sea you created! I would love to get such an encouraging card like yours. It’s done so good and the scalloped die cuts fit the bill. The narwhal has such a cool lookin’ expression. Great job. Awesome card!! Looove how you did the waves!! So fun! What a magnificent card! Love the scalloped borders you used for the ocean! OMG!! Love the starry background & awesome use of that border to make your waves!! Oops somehow this comment ended up on your blog; Suzanne! I don’t know how! I was on Yuki’s blog. Weird! Go ahead and delete this if you can, hun! Nice card and love the colors. TFS.